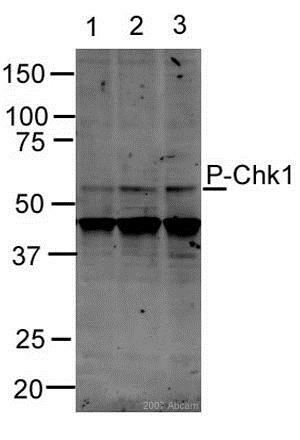 Chk1(Phospho-Ser317) Antibody detects endogenous levels of Chk1 only when phosphorylated at Serine 317. Synthetic phosphopeptide derived from human Chk1 around the phosphorylation site of Serine 317.
ab38518 was affinity-purified from rabbit antiserum by affinity-chromatography using epitope-specific phosphopeptide. The antibody against non-phosphopeptide was removed by chromatography using non-phosphopeptide corresponding to the phosphorylation site. Our Abpromise guarantee covers the use of ab38518 in the following tested applications. ICC/IF: Use at an assay dependent dilution (PMID 19390600). WB: 1/500 - 1/1000. 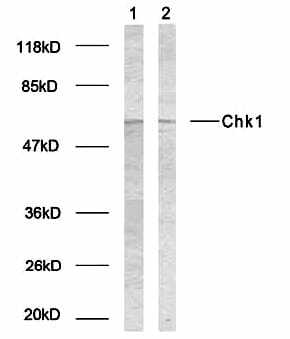 Detects a band of approximately 63 kDa (predicted molecular weight: 54 kDa).